In today's high school and even youth basketball climate, parents and players seem more focused than ever on working towards the goal of becoming a college athlete, or even a college scholarship. The positive result of this common drive has been the widespread talent increase across the country in the game of basketball. This is not to say that modern-day players are better than players from other eras because that would be impossible to measure and most likely untrue. It is simply the result of quantity increase, as more and more players participate in competitive basketball year round. The inherent danger in hyper-focusing on playing college basketball or even worse attaining a scholarship is that parents and players lose sight on what sports are supposed to be all about. Let's start with the facts for college basketball. 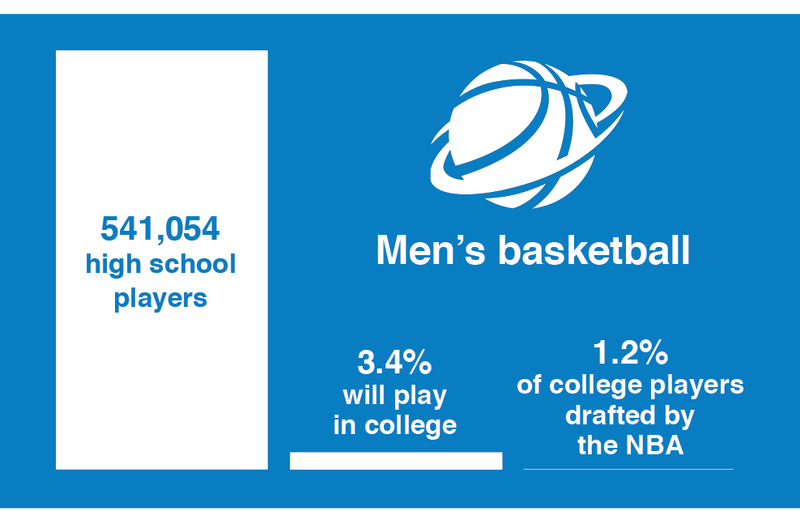 Last year, less than 4% of every high school senior on a varsity basketball roster went on to play on the college level. That's DI, DII, and DIII combined! Of that 4%, less than 1% earned a division I scholarship. Click here to see stats from NCAA The odds of actually playing at the college level are stacked up against you. That doesn't mean parents and players can't dream and strive towards that goal, but along the way, it is important to remember what sports are supposed to be about. Life lessons including accountability, discipline, toughness, teamwork, work ethic, and the ability to handle disappointment are all examples of what a parent should want their sons and daughters to get from playing sports. In today's sports climate if a player loses his/her starting position the initial reaction often is panic. "If my son doesn't start, how will college coaches see him play?" In many cases, this thought process leads to a call to the coach, a poor attitude, or even a transfer from the school. Jalen Hurts, demonstrates tremendous character in handling benching during national championship game. Reality check! Remember the aforementioned 4% stat, your son might not be a college player, but that shouldn't be your focus in this situation. As a parent, if your first instinct is to blame the coach what life lessons are you teaching your child? Instead, encourage your son to advocate for himself. Have him talk the coach to get feedback on what he can do to regain his starting spot. Guide your son through the feeling of disappointment by encouraging him to work harder, get better, and continue to be a great teammate regardless of playing time. Always keep the prospect of playing in college as a goal, but don't let that goal drive your reactions in tough situations. Learning how to fight through adversity in competitive situations will benefit your son well beyond his playing career on the court. He will be stronger as an individual and much more capable to deal with adversities throughout life. And that is was sports is all about! Why Businesses Should Hire Athletes?